Give your patio some character! Our guest today built her family an outdoor coffee table using a large metal tub as the base. Brilliant! 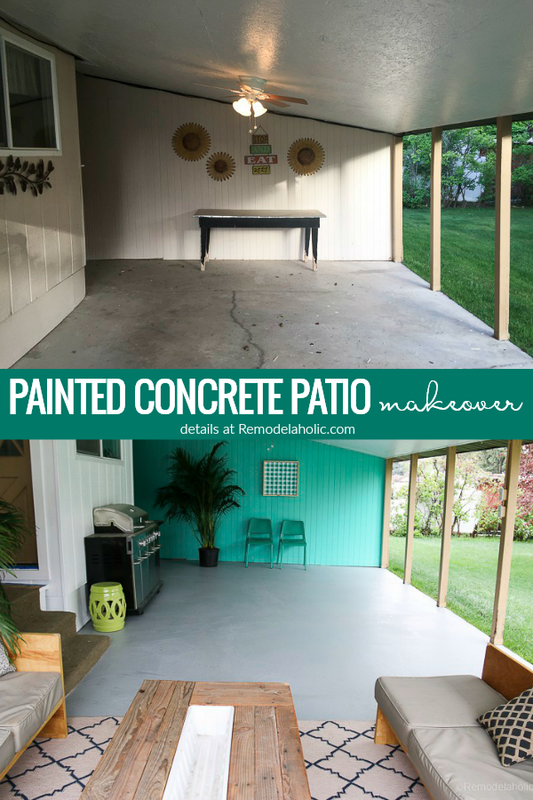 She wrote an excellent tutorial and we’ve featured it here for you to add the comfort and functionality of a sturdy patio table to your space. Now see how Melissa built this outdoor coffee table for her patio! Hi, I’m Melissa from A Place to Nest. I juggle a busy nest filled with a five year old son, a busy Hubby, a full time job, all while updating our builder grade home. I love wood tones, white frames, and if I could paint everything with chalkboard paint I probably would. I was thrilled when I was contacted by Remodelaholic to show off my bucket outdoor coffee table. It all started with our patio table set breaking to pieces from the strong winds by my house. Enter a large bucket I use for my Christmas tree and my imagination. The rest, as they say, is patio history. Here is a close up of the bucket I had on hand (bucket size 3 feet at the widest part). I decided for walking space to put it right side up and drill a few holes in the bottom for any possible water drainage. Remodelaholic note: We’ve had lots of questions asking where you can find a similar bucket to make this awesome table! We found one that’s just a little smaller than Melissa’s on Amazon (affiliate link) here. We’ve also had fans tell us that their local farm or tractor supply store stocks large washtubs and metal bins like this. If you’ve built this, we’d love to see pictures and know where you found your bucket! Next came some planning and decisions about lumber and how to attach to the bucket. I decided to buy some 1/4 inch plywood to use as the base to attach the 2×6 boards to. I wanted this table to withstand drinks, kids, and most of all resting feet on top of it so a base was key. I drew a circle and cut the plywood into a circle. The next step was my favorite to get all negative energy out… the beating of the 2×6 boards to give it some character. After that mood-altering step I then glued the 2×6’s to the circle and let dry overnight. I followed the same technique by using the plywood as my template and cut the 2×6 boards to match the circle. I already had stain on hand that I used on my wood wall art and on my chunky bathroom shelves so I stained it up and watched the character come out. Finish with a coat of poly and my table top was done. I attached it to the base using liquid nails and then finished with some clear, outdoor caulk to keep the water out. Let’s get to the final product since that is what really matters. Cocktails anyone? The coffee table ends up being the perfect height with our chairs (luck was on my side) and we have enjoyed the deck so much more already and summer has just started. Anyone want to come chill out with me? I want to come chill out with you, Melissa! Thanks for sharing with us! 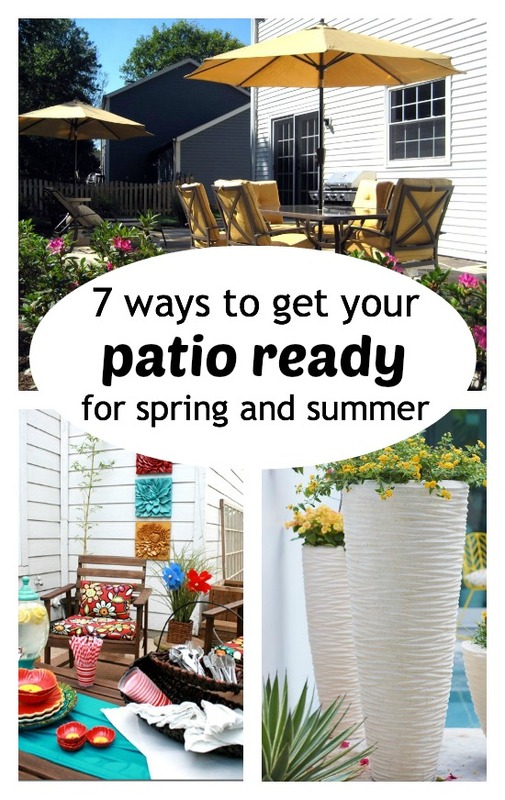 Looking for more ideas for your patio? See below! Thanks again for having me post on your amazing site and share my new outdoor coffee table! It has been used every weekend so far. Such an easy project with a big reward! Where did you purchase your oversized galvanized container? Christe, I believe she answers that in the comments at 7.1. Just thought I would let you know. Thanks for the comment. How deep is the galvanized bucket? She also answers this in the comments. Thanks! Where can you find 3 foot buckets? I really want to make this! I just entered the size bucket I wanted in a search on line. I recall some feed stores and websites are where I found this option. Love the table!! Love that it is made with a bucket!! Thanks for the tutorial!! I love the outdoor table it turned out great! Thanks for the tutorial. I just love this idea! Where did you purchase the oversized metal container? What size is it? 15 gallon, 17 gallon, etc.? A wash Tub at farm supply store. I see your tub is about 3 1/2 feet wide. How deep is it? Absolutely love this ! I just bought my daughter and son in law an offset umbrella for their totally bare deck and was looking for a table idea….BINGO !!! Question….love the 4 chairs in the pic, may I ask where you got them? Once again….great table ! Thanks so much for the nice comments! In terms of the chairs and the rug. Both of them were from overstock.com. The rug was new this year but the chairs are a few years old. We love them because they fold up! Perfect for storage. Love all of it, I was wonder the sice of your rug? Melissa, where did you find a bucket that size? Love your idea? I found it on line but also heard from some people that feed stores (like a farm and fleet) carry them too! Thanks for the nice comments! Love it! Where did you get the rug? I’m obsessed! Would you mind telling me where you got your lawn chairs from? It looks like you may have spray painted them? Am I right? I got the chairs on overstock.com. They were black from the start but one day I might change it up. You never know 🙂 Have a great weekend! Sounds like it will be really cool! Good luck on the search! This is gorgeous and I can’t wait to recreate this on my patio! Do you happen to know an estimate of the gallon size of the bucket you used? I can’t quite seem to find one big enough! Thank you so much for sharing your great ideas! I’m dying to know where those black chairs came from that are around the metal table! Thanks so much! The black chairs are from Overstock.com. They fold down which is super handy for storage! We made this and it looks awesome but after the first rain the plywood warped and separated from the other boards. How did you keep that from happening? Nicole sorry to hear about that! How frustrating after all that work. What I found myself was some of my boards moved after a few rains and it came down to the type of glue. One side I used some liquid nails and those boards never moved all summer. But when I had run out I used some “other” glue and those did move. I used some liquid nails and secured it into place and my table was back in business again all summer. Hope that helps! do you know what gallon size bucket this is?! thanks! Hi. What kind of saw did you use to cut the plywood and lumber? Love the look. Thanks for posting it! Hi there. I used my jig saw and it cut perfectly. Thanks for the nice comments. Love it, but not sure how you attached the wood to the bucket? Thanks! Some people are using it for storage so they used a hinge. I am not using anything to store in it so liquid nails worked great for me. If I understand the tutorial correctly, the top is glued to the galvanized container. I came here from Buzzfeed where they talk about using the tin for storage. I wonder how to do that, would there have to be some kind of framing underneath to make it sit on the container sturdily but still be liftable? Juli, if you cut another piece of plywood to the diameter of the inside lip of the tub, it will provide stability and the top will be removable. FYI, this size of bucket is called a wash tub. When we visited my grandparents on the farm, the wash tub did double duty as a bathtub. The old farmhouse had only cold running water, so we had to heat water on the wood burning stove for baths. I am in the process of building a deck, so I will need furnishings soon. The only thing I would change about this table is to cut another round of plywood the diameter of the inside bucket edge. It would provide a bit more stability when screwed to the underside of the top. I need it to withstand the clumsiness of my sister. If you look in the dictionary under Klutz, you’ll find her picture. True story. Haha, don’t we love our sisters? 🙂 Thanks for the extra information — extra stability is always a good idea!